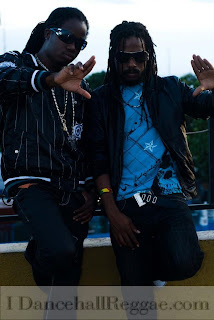 Caribbean Lifestyle Media-Andrew and Wada Blood left Jamaica recently on a promotional tour for their latest singles, "Irie" and "Find A Way". Irie is best described as a feel good Dancehall tune which does just that, make you feel irie. In response to this experience, Wada stated "So far the shows have been going well. We did a show at a club in Hollywood the other night and in Santa Barbara and some more and we are getting ready to do some more and mad up di place" . While in California, Andrew and Wada experienced the recent Earthquake to hit Los Angeles, California. Don't worry Andrew said, "We are here and safe. I was asleep when the earthquake happened, but it woke me up. We jus' grateful and give thanks that it wasn't bigger or worse than that". I am sure we will continue hear more about these two as they continue to put the time into working their latest single in the International market.